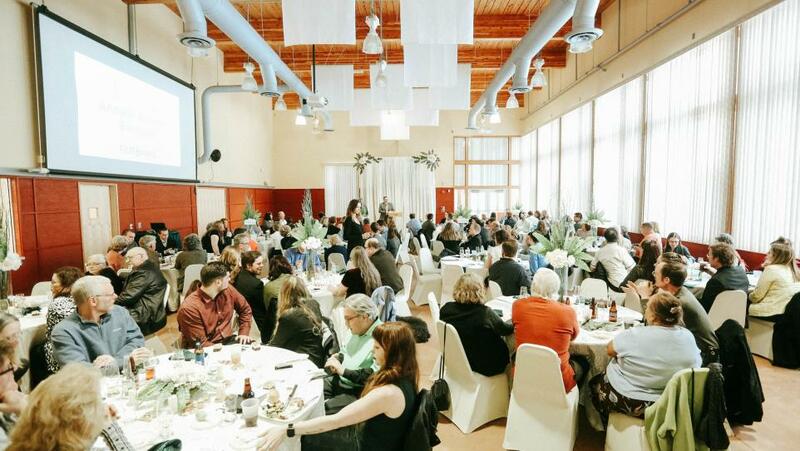 Fairbanks, Alaska (AK) – Explore Fairbanks acknowledged the contributions of partners and other individuals and organizations for their support of the local visitor industry at the 2018 Annual Awards Banquet on April 20 at Birch Hill Recreation Area and Cross Country Ski Center. Awards were presented as follows: Golden Heart Award to Bob Eley, for his exceptional hospitality, commitment and effort to Fairbanks’ visitors; Aurora Award to the Alaska Railroad, for its contributions to the development of the Fairbanks visitor industry; Jim and Mary Binkley Award to Sean Kurdziolek Portraits and Gallery, for their creation, innovation, courage and entrepreneurialism in the introduction of a new product; and the Raven Award to Midnight Sun Run, for promoting a distinct local, statewide, national and international interest and awareness among prospective visitors. In 2017, Explore Fairbanks established the Fairbanks Tourism Hall of Fame to recognize outstanding individuals who have made iconic and significant contributions to the tourism industry in the Fairbanks region through their lifetime of leadership, passion and dedication. This year’s inductee into the hall of fame was Ed Peebles. Hilda MacDonald was recognized as the Golden Heart Greeter of the Year Award for dedicating herself to helping make a visitor’s experience special and memorable. Staff service awards included Julia Parzick for five years of service and Angie Cerny for 10 years of service.